With my olfaction research ending at Zeno speed, I've started pilot experiments for everyone's favourite sensory modality, taste! The idea is to record from each layer of taste (insular) cortex, and compare the "taste receptive fields" of neurons from each layer. To identify the layer I record from, I'm using channelrhodopsin-aided cell identification: I record extracellulary from random neurons in cortex; the mouse I'm recording expresses ChR2 in a specific cortical layer; and then I identify which layer of cortex I'm recording from by photostimulating and recording evoked spikes. To get ChR2 expression in specific cortical layers, I'm using transgenic mouse lines that express Cre in specific cortical layers, and crossing those Cre mice with floxed-Channelrhodopsin (all lines are from MMRRC, and the names are available on request). This technique has been dubbed PINP (Photostimulation-assisted Identification of Neuronal Populations) by the Zador lab (you can blame them for the label). In the original PINP paper, to get cell-specific expression of ChR2, Lima and colleagues used parvalbumin-Cre mice, and injected floxed-ChR2 (AAV-LSL-ChR2-YFP) into A1 of auditory cortex. They then stuck a tungsten electrode into A1 (in vivo), and recorded spikes. Some units reliably responded to light stimulation (panel B, below), while other units did not (panel C, below); the ones that responded to light were presumably parvalbumin-expressing neurons. From Lima et. al., 2009: "Figure 4. 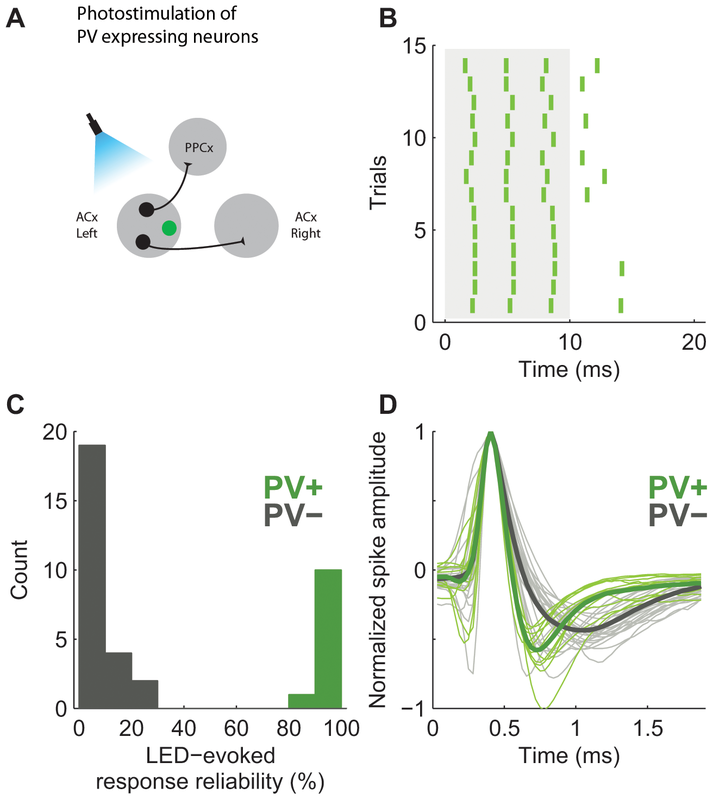 In vivo photostimulation of parvalbumin expressing auditory cortex neurons. 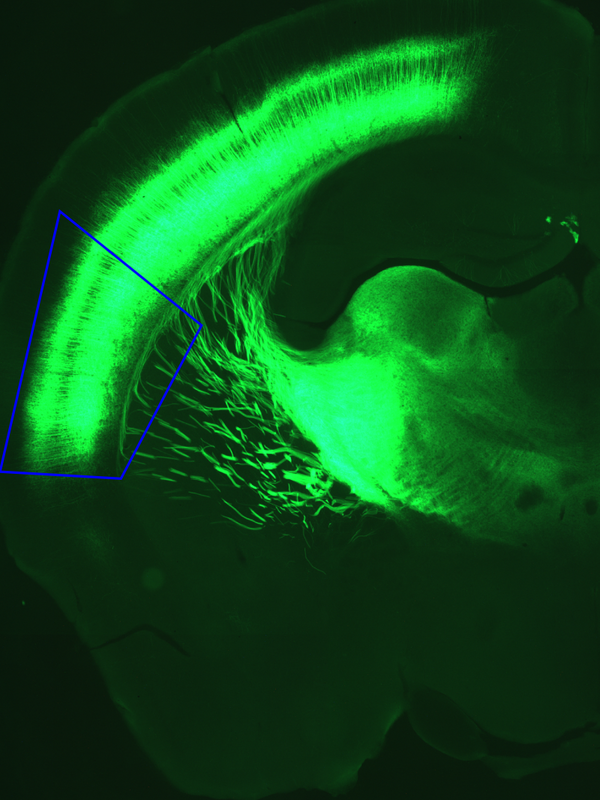 (A) PV expressing neurons in the mouse auditory cortex, labeled with the binary Cre-AAV system, were tagged with ChR2 (green). (B) Spike rasters of a well isolated single unit that responded to light activation in the mouse auditory cortex. Light was on from 0 to 10 ms. (C) Reliability of light-evoked responses in all the cells recorded in the mouse auditory cortex. Reliability was computed as the fraction of trials in which the firing rate within the 40 ms after the start of the light pulse was greater than within the 40 ms immediately preceding the light pulse. (D) Action potentials originated from ChR2-expressing neurons were narrower than spikes originated from the rest of the population (green - ChR2 positive, gray – unlabeled cells)." One thing that surprises me about this experiment is that the spikes were delayed by ~2.8 +/- 1 ms. 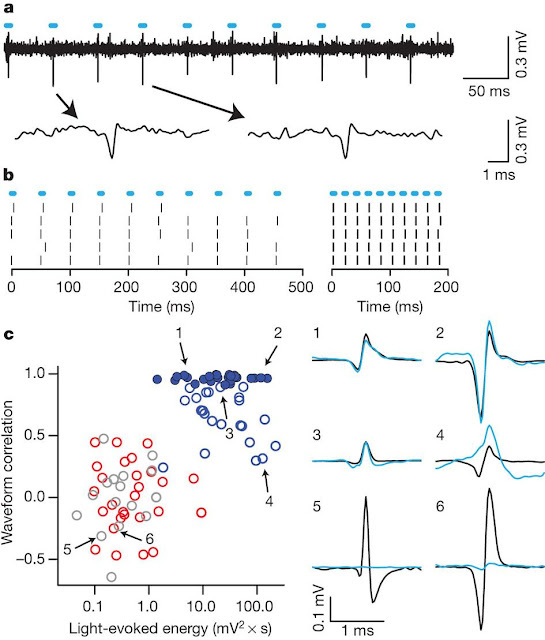 In other channelrhodopsin papers, people are able to get strong channelrhodopsin effects with light pulses of only one or two milliseconds. For example, Smear et. al. expressed ChR2 in olfactory epithelial cells, and mice were able to detect fine changes in photostimulation latency using 1 ms pulses. For another example, Atasoy et. al. were able to detect strong IPSCs in brain slices following a 1 ms pulse (Fig. 3b). If Lima and Zador had used 1 ms pulses, they may not have been able to evoke spikes. Given the wide variability in cell sizes, conductances, and excitability, when performing PINP, it is probably important to calibrate the duration of the light pulses. Almost all of the papers that cite Lima are reviews about the potential of optogenetics (and there are a LOT of reviews about optogenetics), but I also found a few papers that actually used the PINP technique. The first is from the lab of Young Investigator Rui Costa. Xin and Costa recorded from the substantia nigra, and were interested in differentiating between dopaminergic and GABAergic neurons. In addition to well-established criteria like spike width and firing rate, they used PINP to identify TH-ChR2 neurons (generated by infecting AAV-ChR2 in TH-cre mice). They implanted tungsten microwires into the substantia nigra, and stimulated the area with 10 ms light pulses. Raster plots and PSTHs from putative TH-ChR2 neurons following photostimulation at t=0 ms. Recorded using tungsten microwires, and photostimulation pulses of 10ms. From supplemental figure 3 from Xin and Costa, 2010. During photostimulation, they saw an increase in firing rate in the putative TH-ChR2 neurons. To be honest, I find these responses underwhelming due to the jitter. 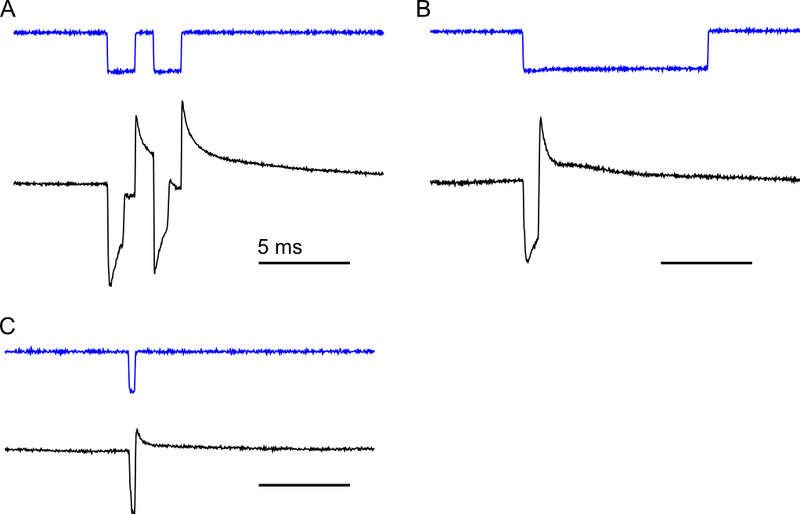 In the example above from Lima and Zador, the evoked spikes were delayed, but extremely precise. In comparison, this simply looks like an increase in firing rate. I know nothing about the connectivity of the substantia nigra, but if you told me that the above raster plots were recorded from a neuron downstream of TH-ChR2 neurons, I would not argue with you. The other example PINP I found comes from the lab of Naoshige Uchida, a former olfaction researcher. Cohen and Uchida were interested in how dopaminergic and GABAergic neurons in VTA encoded reward. They targeted dopaminergic neurons using DAT-cre, and GABAergic neurons using Vgat-cre, and expressed ChR2 via AAV. They recorded extracellularly using twisted wire tetrodes, and stimulated using 5 ms laser pulses. a. Voltage trace of light evoked activity. b. Photostimulation at 20 and 50 Hz evokes reliable and precise spikes. c. (left) Plot of photostimulat-ability ("light-evoked energy") versus the correlation between spontaneous and evoked waveforms for individual units. Only those cells that had light-evoked spikes, and well correlated waveforms were considered to be ChR2-expressing. (right) Example waveforms for different units shown on the left. 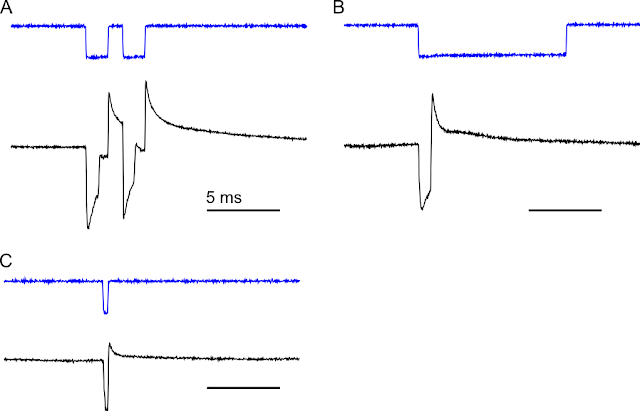 Following photostimulation, they were recorded precisely timed spikes (panels a & b, above), at up to 50Hz. To ensure the light-evoked units were the same as the natural units, they performed a control I quite liked: they calculated the correlation coeffecient between the waveform of the photostimulated spikes and the natural spikes (panel c, right). Only those units that were both light-activated and maintained spike shape were considered to be TH-ChR2 expressing (panel c, left, filled blue dots). The precision of these spikes casts further doubt in my mind on those observed by Xin and Costa. I have started to try to perform PINP myself, and am using this post in part to structure my thinking about what is happening. Like all the previous papers, I'm using a Cre-lox system to get layer specific expression of ChR2. Unlike the previous papers, however, I'm using a transgenic floxed-ChR2 mouse to get expression. Layer specific expression of YFP-ChR2 in somatosensory and taste cortex (blue box). Sagittal section taken at ~ -1.2mm from Bregma. Please pardon the overexposure. As a pilot experiment, I anesthetized a mouse, and recorded from sensory cortex (I would have recorded from gustatory cortex, but had not stereotaxically head-posted the mouse, and decided not to risk an electrode recording by the edge of the skull). For recording, I used a Silicon optrode from NeuroNexusTech (A1x32-Poly3-5mm-25s-177-OA32). For my recordings in the olfactory bulb, I used electrodes that had an area of 312 um2. However, NeuroNexus does not make optrodes with electrode sizes that large (perhaps due to the photoelectric effect), and the electrode size for this experiment was 177 um2. In the olfactory bulb, using the 177 um2 electrodes, I recorded fewer spikes than with 312 um2 electrodes. Whether due to electrode size, the fact that the cortex is generally quiet, or due to the anesthesia, I didn't record any spikes in somatosensory cortex with the optrode. Despite not recording any spontaneous spikes, I still tried photostimulating. The optrode consists of a single shank with electrodes forming two columns 200-300 um long; the optic fibre starts 200um above the top electrode. While doing this experiment, I neglected these measurements, and made a mistake. Somatosensory cortex is ~1mm deep, and the somas of the ChR2-expressing neurons are in the deepest layer. However, I only penetrated the optrode 500-600um, so I would not have been able to record evoked spikes. Given the caveat that my electrodes were not in the layer of interest, I was able to record light-evoked LFPs. For the initial stimulations, I saw strong photoelectric artifacts at the beginning and end of the light pulses because the laser power was too high (panel A, below). The photoelectric artifact was easily removed by simply reducing the laser power. LFPs recorded from light stimulation. A. (top) Light pulse. (bottom) LFP recorded. At high laser power, there is a photoelectric artifact at the beginning and end of light pulses. B. At medium laser power, there is no longer a photoelectric artifact. A 10 ms light pulse evokes a 2 ms LFP deflection. C. A 1 ms light pulse evokes only a 1 ms LFP deflection. With a more reasonable laser power, I was able to record LFP activity on every electrode I recorded. Even for longer light pulses, the LFP activity was fairly short. Whether this reflects a single evoked action potential in the deep layers, or something else is uncertain. To see if I could get the LFP activity with short laser pulses, I reduced the pulse duration to 1 ms, half the LFP duration. This in turn reduced the duration of the LFP activity. So there is some dynamic range in stimulation between 0 and 2 ms.
As the title of this post reflects, PINPing ain't easy. There are a few improvements I need to make before graduating to recording from taste cortex of (trained) awake mice. First, I need to penetrate the damn electrode to the layer of interest. This will be easy in somatosensory cortex, but may be complicated in insular cortex given that the layers are parallel to electrode penetration. Furthermore, I'm performing these experiments on mice head-posted 1-2 weeks earlier, which will complicate stereotaxy. Second, I need to be able to record spikes. All of the papers above recorded using tungsten wires, and got clean units. I'm concerned that the electrode sizes we are using are simply not large enough to record large number of clean units. Hopefully the difficulty of recording spontaneous spikes was due to the anesthesia and layers recorded. Finally, I am somewhat concerned that the transgenic expression is simply too high. If photostimulation activates all the neurons in a layer, will I be able to record single units? Or will the coactivation muddle any recordings? And will the strong LFP activity make isolating spikes difficult? I have two priorities right now. First, I need to solidify the behavioural paradigm, and see how many training sessions it takes for mice to acquire the protocol, and measure how many trials I can expect out of a mouse before it is sated. And second, I need to refine PINP, and make sure that I can actually record from ChR2-identified neurons.